The most anticipated film of the year has been dominating headlines since Wednesday. Sadly, it doesn’t open this weekend. In fact, it doesn’t open for another month, which says a lot more about the new releases for February 24th than it does The Hunger Games itself. After a remarkably consistent February, where several new movies have performed to best-case scenario (and above), we’ll come crashing back to earth this weekend, at least somewhat. A couple of this weekends openers have a chance to open decently, and one may even hit the $20 million mark, but a $20 million debut weekend in February doesn’t carry the same cachet it used to. Tyler Perry is arguably the most prolific directors working in the business. After writing the screenplay for Diary of a Mad Black Woman and seeing it exceed expectations, he moved on to helm ten different theatrical releases in the years since 2006 (that’s about two per year), and has made Lionsgate a very, very happy distributor as he effectively has what seems to be a lifetime contract with them. During that time, movies he has directed opened with a low of $11 million (Daddy’s Little Girls) and a high of $41 million (Madea Goes to Jail), but the one empirical piece of data we have is that his Madea movies traditionally perform better than his non-Madea movies. The thing is, that distinguishing characteristic becomes less and less important with each passing movie he does, because “Tyler Perry” is becoming a brand unto itself. 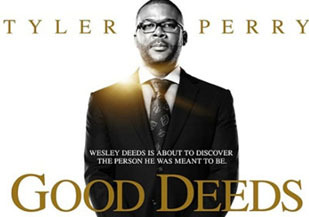 His recent non-Madea movies seem to settle nicely within the $17-$29 million range, and since the marketing for this weekend’s new film, Good Deeds, is pretty much “Tyler Perry as Tyler Perry in a Tyler Perry film!”, we figure it can slot in at around $21 million. These films serve their audience well, and even if they are critically ravaged, Perry is a positive presence in “Hollywood” who truly understands the people he’s hoping to engage.